Not all of our customers come to us with professional prints and an exact idea of what they want. All Fabwest needs is a basic sketch or description. 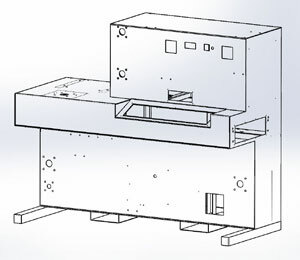 If old parts are available for reference, we can provide the prints required for fabrication. By utilizing non-contact inspection equipment, we are capable of scanning flat reference parts that can then be converted to a digital file. Reverse engineering of parts typically takes a few days depending on complexity. If you're working on a new idea or have a product that you'd like to revise, Fabwest can provide any consultation required to ensure your project is completed in the most cost effective manner possible. Here at Fabwest, fabrication is more than just a trade, it is an art, and we want to make sure you start with the right brush and canvas. By providing full CAD services and generations of handed down knowledge, we can offer our expertise in order to eliminate unnecessary costs. All jobs at Fabwest are estimated through our ERP software allowing us to provide an exact cost on parts and price breaks. Once material, finish costs, and setup and cycle times are analyzed, price breaks can be given immediately and will always be more accurate than the traditional pencil and paper approach. We can also help eliminate waste and provide better material yield on a job to job basis. 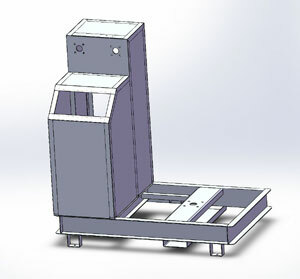 All parts created at Fabwest are first drafted using Solidworks 2013. When 3D drawings are completed, they are cross inspected while still in a digitally formed state. After cross inspection, flat patterns are then imported into the appropriate CAM (Computer Aided Manufacturing) software for tooling and or pathing. 1st article flat patterns are then cutout and inspected once more on our non contact inspection machine to ensure tooling and pathing are correct. If geometric tolerance meets the customer's requirements, the part is then moved on to secondary operations. By saving both the inspected 3D model and flat pattern, we are able to make future revisions without having to charge additional programming time or keep hard templates.